These are American photographers and the surprise is that there's no mention of New Zealand photographers; even though Macpherson says that she is aware of, and looks closely at, the work done by New Zealand photographers, particularly the work about journeys around New Zealand and explorations of place and identity. What does that imply about NZ photographic culture, or Macpherson's understanding of that culture? Maybe Macpherson quietly references other NZ photographers, such as Morrison and Henderson, as well as Lawrence Aberhart and Peter Peryer. Macpherson says that the body of work in Old New World is part of trying to understand her world and where she fits in it. In that sense photography--- as meaningful, sensuous, particular works of art---is a form of thinking and self-discovery. What this indicates is that though artworks are indeed objects, the truth-content of art is of the world while also offering critical reflections upon it. I mention Macpherson's work here because when I was looking at the photographs in Old New World I wondered if there is similar work being done by contemporary Australian art photographers. I cannot recall any off hand. 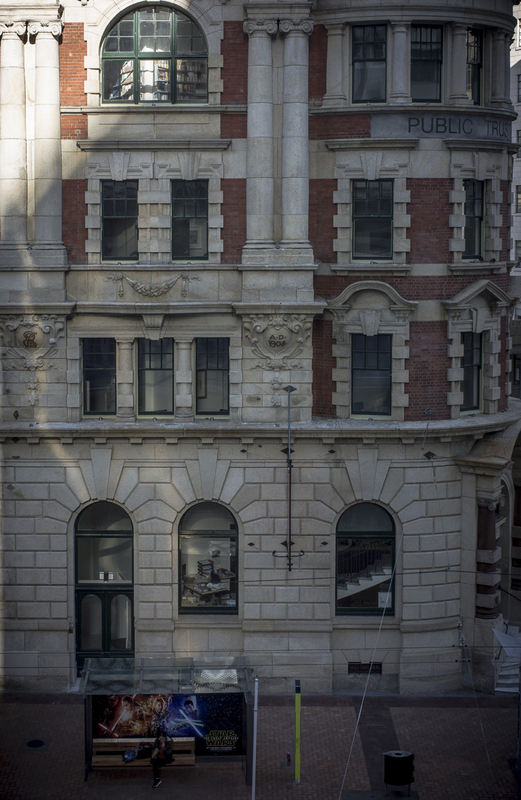 Certainly no photographer that I know of in Adelaide is working on such a project---exploring the way that the layers of time and history and development that sit within a townscape, and to photograph things within their everyday context. Yet Australia as a place to be has been changing rapidly since the 1980s. So has its identity as a result of these changes. It is quite different from our remembered past because things change: buildings are demolished or their uses change or they have facelifts; towns can slowly die. These with their street and artworks are the public containers of our history and identify.